Indoor water parks in Michigan offer a great way to beat the cold winter months. Whether you are a resident or a visiting tourist who needs to take a break from the chilly weather, Michigan's indoor water parks provide you with numerous opportunities to make a splash! 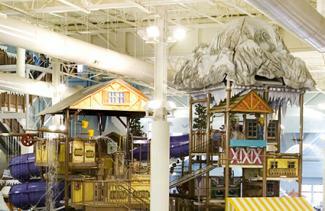 Located in Boyne Falls in Northern Michigan, Avalanche Bay is the state's only free-standing indoor water park. The facility also enjoys the bragging rights of being the state's largest indoor water park, as well as being rated number one in the nation by the Huffington Post. The park's Winter Wonderland theme includes a Swiss-Austrian cityscape, but the weather-proofed indoor complex is kept at a comfy 84 F year-round. Visitors of all ages can enjoy a wide variety of options for their water park fun. Kids will really enjoy the Splasherhorn feature, a play structure that features multi-level bridges, waterfalls, and miniature slides. Every ten minutes a mountain feature erupts into a roar of water, which pours down and douses everyone in its path. Aspiring surfers of all ages will enjoy Rip Zone, a surfing simulator that teaches visitors how to catch a wave. If you love rock climbing, South Wall is where you will want to be. This wet and slippery climbing wall is perfect for daredevils looking for a refreshing climbing adventure. The park is located next to the Mountain Grande Lodge and Spa. Lodge guests receive discount admission to the park. Single day tickets: Prices for a single day admission vary, so check the pricing calendar. Multi-day tickets: Two-day tickets average around $59 dollars. Season passes: Season passes are only $60. Oakland County Moms take viewers on a tour of the different rides and attractions so you can get a feel for the park before you visit. Watch the video below to learn more. While Avalanche Bay is the only freestanding indoor park in Michigan, there are plenty of hotel-based options. Some hotels with water parks offer only basic accommodations, while others offer a deluxe resort experience that can make every night a good night's sleep. Visitors looking for an indoor water park hotel in Michigan can compare the fun and excitement of the various aquatic attractions to find the best hotel to meet their needs. The Great Wolf Lodge in Traverse City is part of the popular north woods theme resort chain. The popular indoor water park offers many different attractions, including a four-story, 12-level interactive fun fortress; tube, body, and kiddie water slides; and a 1,000-gallon tipping bucket to cover everyone with a splashy surprise. In addition to the indoor water park, the Great Wolf Lodge also offers an outdoor water park area that is open seasonally. The outdoor area includes water basketball, a sun deck, family cabanas, and plenty of geysers and fountains for everyone to enjoy. Visitors found the park a great vacation for younger children versus teens. Other positives cited include the hotel's honoring of deals announced after reservations are booked. The water park is reserved for resort guests only. Located in Dundee, Splash Universe is home to 163 themed guest rooms and suites, as well as numerous indoor water features and other activities. Options include Goldmine Adventure water park slides, a lazy river, and a seven-layer tree house water fun adventure area. There is also a shooting star arcade. According to reviews on Yelp, families enjoyed Splash Universe and found it a smaller, more convenient water park as compared to Great Wolf Lodge. The water park is open to the public, but day passes are limited based on the number of water park guests. Located in Watervliet, Surfari Joe's is a themed water park and hotel with two extreme water slides called Rhino's Rage and Hippo's Hollow. Younger children will enjoy the Pygmy Pond with its spray guns, bucket splashes that drench the whole area and three mini slides for the youngest of visitors. Adults and children alike can enjoy the Zambezi River Run and the Waterfall Grotto Spa where visitors can relax. Guests reported mixed experiences via Trip Advisor about the resort throughout 2012, including varying water temperatures and unresponsive staff. The park is open to the public unless the hotel is full. Be sure to call ahead. Day passes are $25 and begin at 11 a.m. until the park closes at 10 p.m. The park experiences a 15 minute shutdown from 6:30 to 6:45 each day. Built in Mt. 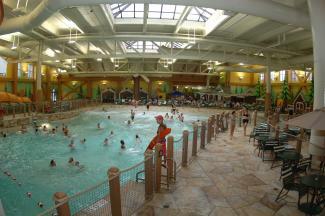 Pleasant, Soaring Eagle Waterpark and Hotel has 243 guest rooms, family suites and other accommodations. Biish Falls, a large play area for younger visitors, is a popular water feature. Several times an hour, an electronic eagle calls for her baby; this signals that a giant bucket will drench the area with about 300 gallons of water. Loon's Loop is a three-story inner tube slide, and FlowRider offers guests an opportunity to surf and much more. Guests left a variety of reviews, with the positives outweighing the negatives where the water park and hotel were concerned. Some complaints included bad or rude service, while kudos were given for the park's smaller, more intimate atmosphere and reduced cost versus parks of a similar nature. Day passes average $17.50 for visitors ages three and older. 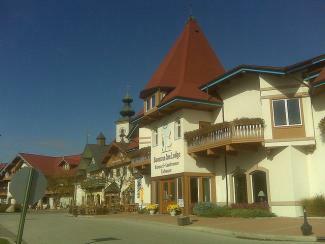 This German themed resort is located in Frankenmuth. The hotel's water park boasts five indoor pools, three whirlpools, a waterfall and more. One pool is designated for toddlers-only, and there is a two-story children's play village. In addition to the indoor water features, guests can enjoy indoor miniature golf, arcade games, on-site restaurants and more. Guests were enthusiastic on TripAdvisor in their endorsement of the lodge as a great family vacation, citing the indoor water park, the dining experience and the beautiful setting as positives. Other guests indicated that the variety of foods available added to their overall positive experience. The water park is reserved for hotel guests only. Located in Frankenmuth, Zehnder's Splash Village features slides, a lazy river, and kiddie play areas along with its more than 140 deluxe hotel rooms. The rooms are all non-smoking and include pay-per-view movies and other standard hotel features. The family suites are luxurious and include an in-room fireplace, sitting area, microwave, refrigerator, and flat screen televisions. Suites can host up to eight guests depending on the specific type of room. Travel Pod reports visitor reviews have steadily increased, with families describing the mixture of Christmas and German themes in and out of the water park as fun. Reviews also indicate that the facility is very family-friendly. The staff also receives high marks in many of the comments. Splash Village is open to the public. Day passes begin at $32; half day passes are also available beginning at $25. Double JJ Ranch and Golf Resort has an amazing range of hotel and accommodation options, including suites, condos, cabins, campsites, RV parking, and themed teepees and wagons. Rustic bunkhouses are open during the summer and feature some adult-only weeks and weekends. The hotel includes studio, deluxe, and Jacuzzi rooms. Suitable for short or extended stays, this resort has something for all budgets. This means everyone can enjoy the western-themed indoor water park, elite golf course, horseback riding, and other resort attractions. Reviews on Travel Pod were mixed, with many guests pointing to a failure of the resort to pay attention to little details including a lack of hand sanitizer at the petting zoo and a lack of some products in the dining areas. Other visitors found their experiences improved from one visit to the next. The water park is open only to hotel guests. Detroit's Best Western Sterling Inn has a small indoor water park with a lazy river, sauna, and different play areas. While the water park is attractive, what sets this facility apart is the hotel itself. The more than 240 rooms and suites at the property include pay-per-view movies, voice mail, and enough space to house up to six guests comfortably. The hotel also has an indoor running track, steam rooms, a video arcade, and more. Virtual Tourist reports positive visitor experiences for the most part. Reviewers indicate that the rooms are large and the water park is fun, although some reviewers stated the water was too cool for the adults. Overall, the food rated as a positive, with some reviewers indicating that the rooms need a face lift or renovation. This is Detroit's only indoor water park. The water park is available only to hotel guests. Hours of operation vary based on the season. Check the calendar before planning your trip. Whether you're planning a vacation out of town or a staycation close to home, Michigan offers a wide variety of options for your water park interests. Stay for a day or a week and bring the kids and play, no matter what area of the state you're visiting.